This is not a car. But it is a pirate ship being attacked by a gigantic sea monster, and that’s good enough for us. W Navarre owns the mind behind it and there’s more to see of this terrifying encounter on Flickr. You Don’t Frighten Us English Pig-Dogs! I don’t wanna talk to you no more, you empty-headed animal food-trough wiper! I fart in your general direction! Your mother was a hamster, and your father smelt of elderberries! Much like the aforementioned medieval altercation, it looks like the French have got the better of us English-types in Sebeus I‘s galleon battle. There’s more to see of this beautifully epic scene on Flickr – click the link above to join the fray. …but we rather like ships and we have control of TLCB keyboard. This beautiful 22-gun light frigate comes from previous bloggee and shipbuilding master Sebeus I. Built entirely from Lego, save for the rigging and sails, and with a wonderfully detailed mini-figure scale interior, Sebeus’s ‘Raging Fire’ galleon is definitely worth a closer look, even if you’re only here for the cars. You can see the full gallery of images via both MOCpages and Flickr – click the links to climb aboard. The Flying Dutchman is a ship that has been condemned to wander the oceans for all eternity. It’s origins lie centuries ago and it has been celebrated in plays, films and operas. Now it has been created in Lego bricks too. This particular version has been built by W. Navarre on Flickr. The hull looks just as worn and battered as wooden ship should look like after years at sea. It also features a nice balcony for the captain at the stern. Click the link in the text to see the ragged, brick-built sails in more detail and hope this never crosses your bows. You don’t need ten thousand bricks to appear on The Lego Car Blog. Around one hundred is plenty, as proven by Flickr’s Johnni with the lovely 1946 Alfa Romeo 6C Freccia d’ora pictured above, and Robert4168 with his superbly inventive micro-scale ‘Buccaneer’s Dread’ pirate ship. See more of each via the links. Certified LEGO Professional Ryan McNaught aka TheBrickMan has welcomed the LEGO Pirates line back into stores in 2015 in a huge way. At 2 meters long and taking 120 hours to build, Ryan’s ‘Brickman’s Bounty’ is the pride of the Brickvention 2015 Lego Show. The ship is constructed as a cut-away so you can can see interior too – Click the link above to visit Ryan’s photostream to see all the details of the Brickman’s Bounty, and you can see all of Ryan’s other works that have featured here by clicking this link and scrolling down. This, simply put, is probably the best Lego creation you will see this year. It’s the work of MaydayArtist, and it’s a perfect scale-replica of the 1577 English Warship ‘Revenge’ that fought (and defeated) the Spanish Armada that was 9 months in the making. It’s all Lego apart from the sails and rigging and was built with the help of a wooden model ship-builder. 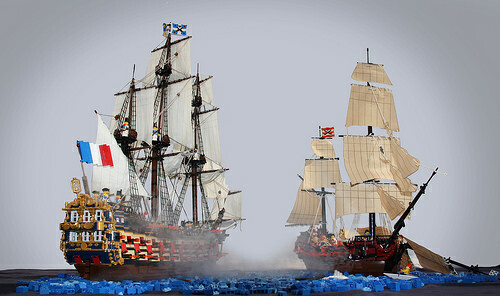 The level of detail is breathtakingly real so we’ve included an extra image in this blog post, but you really need to see the close up shots on the Eurobricks’ Pirate forum here, it’s a new benchmark in Lego shipbuilding. For our French readers, the ‘Revenge’ will also be shown at the ‘Festibriques’ show in Paris this year.